Pattaya has a fairly advanced public transport system, which we believe will be developed over the coming years to include a monorail and a rail to link passengers directly to Suvamabhumi airport. Prices are normally low, allowing for the fact that many fo the Taxis and Buses are used by Thais and the more economy minded tourists. There are "Moto sie" taxi ranks on all the main street junctions, throughout the city. The drivers are recognized by their coloured sleeveless jackets. Each colour, and the writing on the back indicating the taxi drivers group to which they belong. The minimum price is 20 Baht for a short trip. A cross town trip may cost as much as 100 Baht or more, because of the speed and convenience. 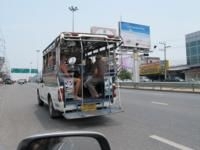 You will see many of these on the streets of Pattaya; they are converted deisel pick up trucks. White ones ply the Naklua to Sattahip route, Dark Blue run anywhere between the City Center and Jomtien. The red ones specialise in trips to the east down Soi Country Club and Nern Plub Warn. 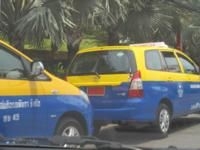 Light blue taxis go to Huay Yai from Naklua. The price is 10-30 Baht per person. Allow an hour to travel from the city to Jomtien. These are fixed or negotiated price taxis for longer trips. Pattaya to the Airport costs around 1000 Baht and takes between an hour and a half to two hours. Thesse long range taxis should be pre-booked. There are many different bus services that you can chose from in Pattaya. There are therefore many main bus stations. 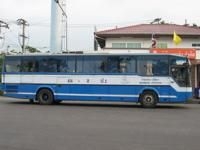 To join an air conditioned bus to Bangkok you need to go to North Pattaya station (Rung Rueng Tours) wwhich is close to the junction of Sukhumvit road and North Pattaya road. To Eakamai or Mochit the fare for the express service (approx.. 2 hours) is 121 Baht and for the Bangna/Trad (approx. 3 hours) route is 113. The first buses leave at 0430 and the final service is at 2200 daily. Express buses leave every 30/40 minutes and Bagna/Trad puts on 12 trips per day.